"Battles of the Sexes" doesn’t break any new ground as a sports film or in terms of its social, sexual commentary. But it is vibrant, non-preachy, and emotionally nuanced for most part of the narrative. Although the film is a crowd-pleaser, allegedly designed for award seasons, Beaufoy’s script is able to take deep and restrained look at the inner lives of King and Riggs. There have been significant shift in representation of women in mass media in the recent years, such that rather than being presented as an object of the male gaze, women are delineated as active and independent personalities, who are greatly involved in re-molding the rigid gender roles. Of course, sexism still thrives in our digital era and for many it continues to be business and entertainment. While on one hand, the powerful media depicts how gender relations are changing quickly and irrevocably, on the other hand it deigns to whip up some excitement or provoke anger by showboating or commodifying the sexist behaviors. The hyped-up 1973 tennis game between retired U.S. Open champion Bobby Riggs, a self-confessed ‘male chauvinist pig’, and Billie Jean King, reigning champion of women’s tennis, an intrepid crusader of female rights, had a lot of historical and political stakes at play. But the lopsided media of the era only chose to turn the game into a commodified amusement, safeguarding the ‘sexist pricks’ who make money out of such ventures. Hence it came up with the conspicuous title ‘Battle of the Sexes’. 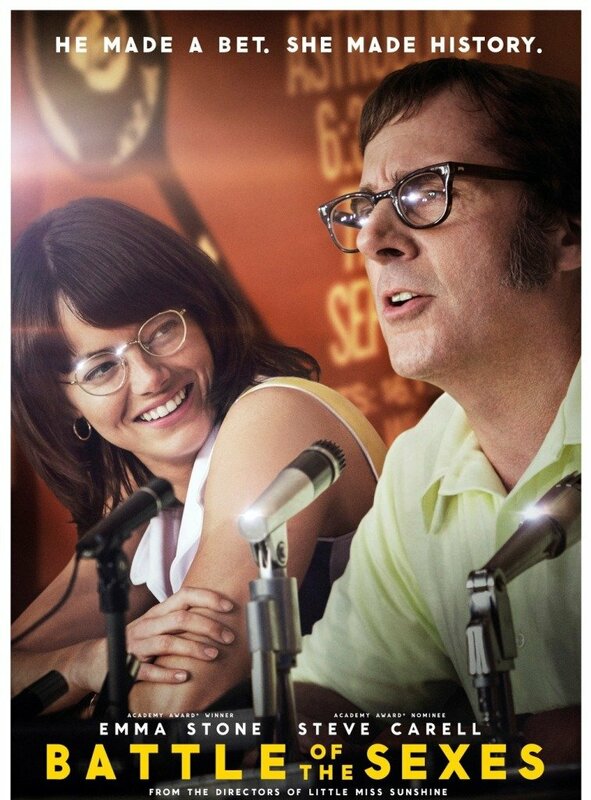 Jonathan Dayton and Valerie Faris’ Battle of the Sexes (2017) — the husband-and-wife directing team behind the indie hits like Little Miss Sunshine (2006) and Ruby Sparks (2012) – however, elegantly peels off the layers of this silly media construct and reckons what or who greases the wheels of the systemic sexism. Thanks to considerably nuanced and streamlined script from Simon Beaufoy (The Full Monty, Slumdog Millionaire), and winsome performances from the two lead stars, Battle of the Sexes deftly lays out the social, cultural and economic dimensions that drove this unique sporting event. From political, judicial domain to private households, the American second-wave feminist movement of the 60s & 70s gained incredible momentum. Yet the then-tennis champion Billie Jean King (Emma Stone) was burdened to face the unapologetically sexist views of tennis association head Jack Kramer (Bill Pullman). Her insistence on equal pay for women is met with condescending and ridiculing comments (female tennis players were offered eighth of the prize money male players received). In 1973, 29 year old King decides to thwart the tennis hierarchy by founding Women’s Tennis Association. Collaborating with a sardonic business partner Gladys (Sarah Silverman), the duo formed their own tennis championship tour; not that the tour circuit payed much, but it was exhilarating for them to venture out independently. While fighting for gender equality, King also confronts inner battles over her sexual identity. King is married to Larry (Austin Stowell), a supportive husband and her promoter. However, King’s eyes sparks only when she sees a hairdressing hipster Marilyn (Andrea Riseborough). On the WTA tour, King and Marilyn begin a tentative relationship and although spoken in hushed tones, King’s sexual preference is known to most of the touring members, including an empathetic gay tennis dressmaker (Alan Cummings). Bobby Riggs (Steven Carrell), a tennis world champion in the 1940s, had a boring desk job of executive in 1973 (at age 55). He is a gambling addict and would wager on just about anything to gain the adrenaline rush. But, on his loving and wealthy wife’s (Elisabeth Shue) insistence, he attends Gamblers Anonymous meeting. 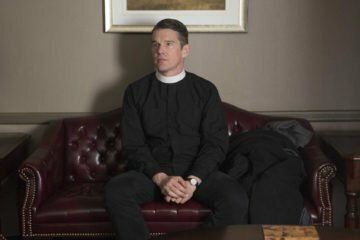 Riggs is not a bad dad or husband, but his narcissistic tendencies and mid-life crisis pushes him to attain the lasting attention of media spotlight. He decides to exploit people’s hunger for dichotomies by exhibiting him as ‘male chauvinist pig’ (which has the Trumpian overtones) and suggests a tennis match with Billie Jean King, whom he calls as ‘hairy-legged feminist’. When King vehemently rejects his offer, Briggs recruits her only rival, Margaret Court (Jessica McNamee) for an exhibition match. An overwhelming defeat faced by Margaret against Briggs made the TV to dub it as ‘The Mother’s day Massacre’. Outraged by the concealed efforts of sexist honchos by using Briggs’ showmanship, King eventually accepts the $100,000 winner-take-all exhibition game. Advertised like a Super-Bowl game, the event has allegedly attracted 90 million viewers in the United States. Battles of the Sexes doesn’t break any new ground as a sports film or in terms of it’s social, sexual commentary. But it is vibrant, non-preachy, and emotionally nuanced for most part of the narrative. Although the film is a crowd-pleaser, allegedly designed for award seasons, Beaufoy’s script is able to take deep and restrained look at the inner lives of King and Riggs. The film’s best heartfelt moments don’t happen inside the sports arena or when characters proclaim their ideologies; it’s when the characters quietly share their inner feelings. The writing identifies the silly dichotomies spun for general populace and takes a behind-the-screen look at the real problems at play. Faris and Dayton’s direction isn’t visually distinct, but acutely expresses its thematic notions. The directing duo perfectly evokes the perpetual sexist analogies of media culture. One TV commentator observes ‘She [King] walks like a man’, while another one remarks, ‘if she’d grow out her hair and lose those glasses, Billie Jean might even be pretty to be Hollywood Star’. In the scene when Riggs calls King, he suggests their match would be termed as ‘Male Chauvinist Pig vs Hairy-Legged Feminist’, she replies before hanging up that she does shave her legs. Beaufoy and the directing couples use such simple remarks of the era to signify how society sets rigid standards for female likability or femininity. Dayton and Farris’ fine directorial moments come during the final act, when Riggs provokes the media circus through bizarre set of PR campaigns. In an interesting note, the key tennis match isn’t over-dramatized, but only takes a broadcasters point of view (shot aerially). Since the inevitable results of the contest were very well-known, the match is cut through rapidly, without amping up unnecessary tension. So those expecting a sports movie would be terribly disappointed. The crowd-pleasing nature of the narrative does lead to few understandable flaws: for one the depiction of Billie Jean’s sexual attraction towards Marilyn, which strictly meets the standards of PG-13 rating. Longing gazes, awkward smiles, and silhouetted kisses, the sexual connection between the two women doesn’t quite portray the sensuality as Todd Haynes achieved with “Carol” (2015). The other meek factor is the lack of characterizing King’s sporting passion. Even though there’s no hint of hagiography, the film-makers establish King more as female and LGBTQ icon that her sporting talent is little less addressed. Nevertheless, the acute performances from Emma Stone and Steve Carell smooth out some of the narrative’s rough edges. Stone doesn’t exactly disappear into her role, but impeccably evinces her character’s conflicts without resorting to overly dramatized emotions. Surprisingly, Carrell almost steals the picture and comparatively disappears a lot into his role. He is brilliant in the quieter moments, when Riggs’ goofy facade expires and profound sadness and alienation surfaces. Riggs’ domestic scenes with his wife and son were heartrending (and what a controlled performance from Elisabeth Shue!). The other super-talented cast members keep the narrative buoyant even as it follows a well-known routine. Similar to last year’s Hidden Figures, Battle of the Sexes (122 minutes) tackles the timely and shamefully relevant issue of gender inequality through a unique historical event. Despite the usual narrative flaws that are attached with ‘true story’ dramas, the film is nuanced and engaging enough to please both the casual movie-goers and cinephiles.